Amazon Price: $13.79 $13.78 You save: $0.01 (%). (as of April 18, 2019 8:23 pm – Details). Product prices and availability are accurate as of the date/time indicated and are subject to change. Any price and availability information displayed on the Amazon site at the time of purchase will apply to the purchase of this product. The Barbie tradition of beautiful holiday fashions continues with this Christmas ornament inspired by the beautiful 2017 Holiday Barbie Doll. Third in the Holiday Barbie series, it's a must-have that collectors of all ages are sure to love. Festive and collectible, Hallmark Keepsake Ornaments come ready to give in a seasonal holiday gift box. The box can also be used for ornament storage. This Hallmark Keepsake Ornament measures 3.2 x 5 x 2.7 inches and comes in a 4 x 5.9 x 3.5 gift box. Ornament is made of plastic with fabric accents. Designed by Katrina Bricker. 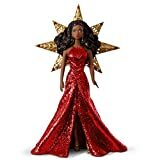 Each piece includes one 2017 2017 African-American Holiday Barbie Christmas Ornament in a gift-ready box. From preserving precious memories to commemorating special milestones, there's a Keepsake Ornament for everyone on your list. Hallmark has been your family-owned creator of greeting cards, gifts, gift wrap and more for over 100 years. We take deep pride in helping individuals connect in just the right way. This Hallmark original Keepsake Ornament features unparalleled artistry and exceptional detail. The ornament is lead-free and made for years of celebrations.